Since the last update when rain had halted planting across the UK, most crops are now in the ground. The delay whilst soils dried out however has rendered large areas of ware crops behind where they might normally be expected to be. That said, in many instances plantings that were 5 or 6 weeks delayed have emerged swiftly. A benefit of this will be the reduced risk of Rhizoctonia infection compared to tubers which may have sat in cold, wet soil conditions earlier on. Same day, different growth stages! An image mirrored across the UK due to protracted plantings. Having focused on late blight (Phytophtora infestans) last time, the focus for this communication is Alternaria – what do we know that is of relevance to the grower, and what should a management strategy look like? Despite increasing in notoriety in recent times, ‘early blight’ (Alternaria) has been around in the UK for many years. The Alternaria pathogen can be found in several forms, but usually will manifest as either A.alternata or A.solani with spread generally occurring as a result of infected soil and harbouring by host debris. As with many pests and diseases, integrated control methods should be used to reduce or eliminate the impact of Alternaria. Ensuring that the crop is free from stress, whether this is nutritional deficiencies or water availability for example, along with decent weed and volunteer management will all help. PCN and FLN can also add to a crop’s woes in stress terms so it is clear that a long-term strategy is required for the best results. Last year, thanks to a network of agronomists, we collected from the field and analysed a number of leaf samples showing Alternaria type symptoms. Positive identification in the field is not easy – and certainly not if trying to distinguish between species. Of the 57 samples that were analysed by NIAB in the laboratory, the majority that were infected with Alternaria had A.alternata (22) whereas A.solani was found on 12 – and, a further 8 were infected with both A.alternata and A.solani. Interestingly, the A.solani appeared to be coming into the crops predominately later in the season. The first infections of A.alternata were confirmed from the third week in June, with the first positive identification for A.solani being picked up in early July, although this only really got going from September into October. This is contrary to other findings reported elsewhere in the past where A.solani has been the dominant species in the earlier part of the season. Varieties including; Markies, King Edward, Vivaldi and Melody are reported to be highly susceptible; however varietal susceptibility to Alternaria is largely anecdotal and is an area where more research is being conducted. It is prudent to monitor all varieties, paying particular attention to stressed crops and areas that have a history of Alternaria. 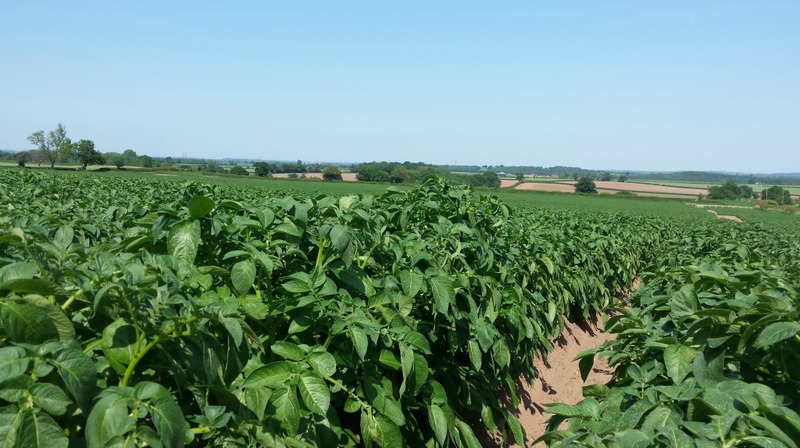 What chemical products will control Alternaria? The first thing to be aware of is that many late blight products will have no effect on Alternaria. It is imperative therefore to choose a product that will, and to not just rely on the standard blight programme to control it. Amphore Plus provides control of both A.alternata and A.solani species as well as late blight. Since it is impossible to differentiate between the two Alternaria species in the field, then this provides welcome reassurance. A.solani in particular can rip through a crop at alarming speed, potentially defoliating it soon after initial infection. Treatment should therefore be as prophylactic as possible – so periods of wet and dry which favour spore germination and release should be monitored. Irrigated crops may be more likely to provide these ideal conditions as will a dense haulm where it has the potential to thrive under the crop canopy in the micro-climate. Amphore Plus is comprised of 250g/l mandipropamid + 250g/l difenoconazole. With a use rate of 0.6l/ha the crop is effectively provided with a full dose of Revus so an effective late blight programme is maintained not compromised. 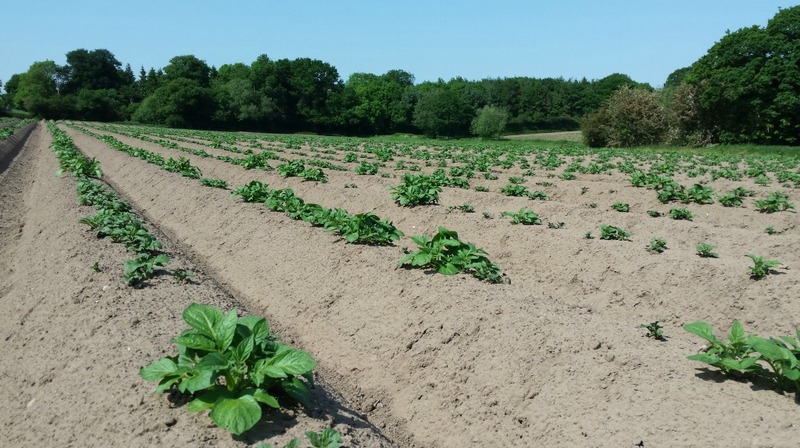 The difenoconazole constituent is the key to the Alternaria control however and in resistance monitoring studies across northern Europe (including the UK) has been shown to provide excellent control of both dominant strains. The 0.6l/ha use rate also means that a robust dose of 150g/ha difenoconazole is applied to the crop – providing 25 grams more than a full-rate tank mix would. Blocking applications before the end of flowering, as opposed to alternating, has been shown to be the most effective in high pressure situations with a typical interval being 7-10 days.